An earthquake swarm occurred at Loihi during 10-11 September and two 13 September earthquakes may have also been part of the swarm. The two later earthquakes occurred at 0311 and 0839 and had magnitudes of 4.9 and 4.4, respectively. Most of the earthquakes from 10-13 September were ~12 km deep and located slightly S of the summit of the volcano. Ken Rubin of the University of Hawaii provided some of the following information concerning Loihi volcano, noting that there hasn't been much activity reported over the last 10 years. The ocean bottom seismometer (OBS) died several months after installation in mid-1996 because the cable connecting it to land was not armored and thus failed early after deployment. However, using available seismic data from the OBS and the Hawaiian Volcano Observatory (HVO) land network, Caplan-Auerbach and others (2001), were able to develop a more precise crustal velocity model so that seismic events at Loihi recorded by the land stations at Kilauea can now be precisely located. Unfortunately, only large events (probably >M 3 or M 4) are detected. Several papers were published on Loihi by Schipper and others (2010, 2011) looking at a reworked pyroclastic section of unknown age on the summit platform and making inferences on eruptive conditions (especially on the conditions of vesiculation and fragmentation). The samples for their studies were collected during the last known geological dives to the summit by Hawaii Undersea Research Laboratory (HURL) and NOAA in 2007. Seismic swarms during 2001-2006. The Loihi web site reported that a seismic swarm was detected at Loihi's summit with earthquakes up to M 5.2 on 13 September 2001. Activity continued for a couple of weeks, with 4 events >M 4 at depths of 12-13 km. No >M 4 earthquakes were detected at Loihi during 2002-2004. An M 4.3 earthquake occurred on 23 April 2005 at ~33 km depth beneath Loihi, and earthquakes of M 5.1 and 5.4 occurred on 13 May and 17 July 2005, respectively, both at a depth of 44 km. The U.S. Geological Survey Advanced National Seismic System measured a small swarm of about 100 earthquakes (the largest 3 events were ~M 4, and between 12 and 28 km deep) that occurred beneath Loihi on 7 December 2005. A more recent earthquake (estimated M 4.7) occurred on 18 January 2006, roughly midway between Loihi and Pahala (on the S coast of the island of Hawaii). References. Caplan-Auerbach, J., and Duennebier, F.K., 2001, Seismicity and Velocity Structure of Loihi Seamount from the 1996 Earthquake Swarm, Bulletin of the Seismological Society of America, v. 91, no. 2, p. 178-190. Rubin, K.H., Soule, S.A., Chadwick Jr., W.W., Fornari, D.J., Clague, D.A., Embley, R.W., Baker, E.T., Perfit, M.R., Caress, D.W., and Dziak, R.P., 2012, Volcanic eruptions in the deep sea, Oceanography, v. 25, no. 1, p. 142-157. Schipper, C.I., White, J.D.L., and Houghton, B.F., 2010, Syn- and post-fragmentation textures in submarine pyroclasts from Lo`ihi Seamount, Hawai`i, Journal of Volcanology and Geothermal Research, v. 191, issues 3-4, p. 93-106. Schipper, C.I., White, J.D.L., and Houghton, B.F., 2011, Textural, geochemical, and volatile evidence for a Strombolian-like eruption sequence at Lo`ihi Seamount, Hawai`i, Journal of Volcanology and Geothermal Research, v. 207, issues 1-2, p. 16-32. Information Contacts: Lo`ihi Volcano website (URL: http://www.soest.hawaii.edu/GG/HCV/loihi.html); Ken Rubin, Department of Geology and Geophysics, School of Ocean and Earth Science and Technology (SOEST), University of Hawaii at Manoa, Honolulu, HI (URL: http://www/soest.hawaii.edu/GG); U.S. Geological Survey Earthquake Information Center (NEIC) (URL: https://earthquake.usgs.gov/neis); Hawaiian Volcano Observatory (HVO), U.S. Geological Survey, PO Box 51, Hawaii National Park, HI 96718, USA (URL: https://volcanoes.usgs.gov/observatories/hvo/). On 10 September an earthquake swarm began at Loihi. The swarm began with a M 5 earthquake and was followed by M 3.5-4.5 earthquakes until at least 11 September. This was the most severe swarm at Loihi since July 1996, when the summit collapsed. "Since November 1984, a renewed increase in earthquakes in the Loihi region has been recorded on the HVO seismic network. The recent activity occurred episodically in three minor bursts on 11 November and 10 and 21 January. From November 1984 to January 1985, 19 earthquakes of magnitude 2.0 or greater occurred in the Loihi region (figure 1). Nine of the larger events ranged in magnitude from 3.0 to 4.2. Figure 1. Plot of earthquakes of M >= 2 in the Hawaii region, November 1984-January 1985. Squares indicate events with depths of 5-13 km, diamonds 13-20 km, and triangles > 20 km. Symbols of different sizes show the relative magnitudes of events; the largest event near Loihi was M 4.2. "Although the current activity is relatively minor, swarm earthquakes characteristically associated with magmatic movement and volcanism in Hawaii have been known to gradually develop from such episodic increases. Significant earthquake swarms inferring magmatic activity at Loihi were detected in 1971-72 and 1975. The recurring episodes of earthquake swarms suggesting development of volcanism S of Hawaii are consistent with the pattern of progressive southeastward growth of the Hawaiian Islands in the context of plate tectonics and volcanism in the mid-Pacific region." The nearest seismic station is about 30 km from Loihi on the S coast of the island of Hawaii. Seismic events at Loihi smaller than magnitude 2 may be recorded by stations on Hawaii, but their locations cannot be determined as precisely as for larger events. Information Contacts: R. Koyanagi and W. Tanigawa, USGS Hawaiian Volcano Observatory. On 20 September, an earthquake swarm occurred in the vicinity of Loihi. Seven events of M 2.8-3.9 were recorded between 1900 and 2300 before seismicity declined (figure 2). Figure 2. Hypocenters of earthquakes in the vicinity of Hawaii and Loihi seamount, September 1986. Courtesy of USGS. Information Contacts: C. Heliker, USGS Hawaiian Volcano Observatory. An earthquake swarm, detected 24 January 1989 from 0736 to 1009, included 12 relatively large events (M 2.5-3.6) and 15 smaller events (M 1.3-2.5) superimposed on continuous background tremor (figure 3). Ten events (M 1.5-2.3) of relatively high frequencies followed during the remainder of the day, then declined. After four events [of M 1.3-2.5] on the 25th, only sporadic seismicity [consisting of four more events during 26-31 January of M 1.2-2.9] was recorded. Frequencies were characteristic of tectonic-type events, suggesting to USGS geophysicists that they may have marked an intrusive episode, but probably not an eruption. Depth control was limited, since the nearest seismic station is on the S coast of Hawaii, >30 km away. Figure 3. Preliminary locations of January 1989 earthquakes (M > 2.0) at Loihi and on the island of Hawaii. Courtesy of Robert Koyanagi, USGS Hawaiian Volcano Observatory. Information Contacts: R. Koyanagi, USGS Hawaiian Volcano Observatory. A vigorous earthquake swarm occurred off the S flank of Hawaii 11-19 March 1990 (figure 4). More than 300 events were registered, about 15 of M 3-4, and some of M >4. Seismologists associated many of the events, including the larger ones, with processes at Loihi Seamount. No acoustic signals (T-waves) were reported. Figure 4. Portion of a seismogram recorded during Loihi's 11 March 1990 earthquake swarm, by a station (AHU) 45 km from the epicentral area. Courtesy of R. Koyanagi. Further Reference. Malahoff, A., 1987, Geology of the summit of Loihi submarine volcano, in Decker, R.W., Wright, T.L., and Stauffer, P.H., eds., Volcanism in Hawaii: USGS Professional Paper 1350, p. 133-144. Information Contacts: P. Okubo and R. Koyanagi, USGS Hawaiian Volcano Observatory. An earthquake swarm centered near Loihi Seamount began with a sudden burst of events between 0200 and 0300 on 19 December 1991, with the most vigorous activity continuing through 1900 the next day. By late afternoon on 23 Dec, seismic stations on Hawaii were no longer detecting any activity in the Loihi area. Of the more than 400 recorded events, 16 exceeded M 3.0. Hypocenters were recomputed with the HYPOINVERSE program (figure 5). The swarm events were located beneath the steep E flank and appeared to be concentrated at 10-20 km depth, although recording geometry does not allow tight constraint of focal depths. Work is continuing to re-evaluate the velocity model and hypocentral estimates. No seismic instruments or hydrophones were functioning on or near the Loihi edifice during the swarm. Figure 5. Hypocenters of swarm events near Loihi Seamount, 19-23 December 1991. Locations are from the HYPOINVERSE program. Courtesy of HVO. A plot of 1986-90 events (figure 6) outlines Loihi's summit. The summit region was surveyed in 1986; an August/September 1991 SeaBeam resurvey from the NOAA ship Discoverer revealed no significant morphologic changes exceeding the 5-15 m resolution of the comparison technique. Figure 6. Hypocenters of swarm events near Loihi Seamount, 1986-90, located using the HYPOINVERSE program. Courtesy of HVO. Information Contacts: P. Okubo, USGS Hawaiian Volcano Observatory; W. Chadwick, Oregon State University; C. Fox, NOAA. A microearthquake swarm occurred on the morning of 12 October 1993 with >140 events counted in two days. The peak of this activity occurred in the first 4 hours with 90 events counted from 1000-1400 on 12 October. Eight of these events had M >3. Hypocentral determinations indicated that the S flank of the seamount was active at that time. Information Contacts: T. Mattox and P. Okubo, USGS Hawaiian Volcano Observatory. An earthquake swarm late on 27 April consisted of 75 events. Only 42 of these were large enough to process for locations. Seismic events from Loihi continued through the end of April, with the largest a M 2.9. Seismic swarms are fairly common at Loihi, and were last reported on 11 July and 12 October 1993 (BGVN 18:07 and 18:10), and 19 December 1991 (BGVN 16:12). This youngest volcano of the Hawaiian chain lies ~35 km SE of Hawaii. The summit region is dotted with numerous lava cones, and the abundant fresh, sediment-free lavas attest to its youthful age. Seismicity indicates that the plumbing system is distinct from that of Kilauea, 55 km N.
Information Contacts: Paul Okubo, USGS Hawaiian Volcano Observatory (HVO), Hawaii Volcanoes National Park, HI 96718, USA. The largest swarm of earthquakes ever recorded on the Hawaiian volcanoes occurred below Loihi seamount in July-August (figures 7 and 8). The seismic network maintained by the Hawaiian Volcano Observatory (HVO) began detecting events from this swarm at 2154 on 16 July; events continued at low rates until 20 July, when counts rapidly increased. More than 4,000 earthquakes were recorded through 29 July. Several hundred of M >= 3.0 were detected, and more than 80 were M >= 4. The largest event, M 5.0, occurred at 2330 on 27 July. The number of events decreased in early August. Figure 7. Distribution of Hawaiian earthquakes during 12- 25 July. Courtesy of HVO. Figure 8. Histogram of the Loihi earthquakes, 3 July-13 August 1996. Each vertical bar represents a 6-hour time period. Courtesy of the Hawaii Center for Volcanology. In an effort sponsored by the U.S. National Science Foundation, an interdisciplinary team of researchers from the University of Hawaii, in collaboration with scientists from the U.S. Geological Survey, the Bishop Museum, and the University of Washington, investigated this unique event. The team left Honolulu at 0700 on 5 August and returned on the evening of 10 August after a six-day observation by the research ship and manned submersible. The following summary is from the daily reports of the Hawaii Center for Volcanology. 6 August. Amidst ongoing intense seismic and inferred volcanic activity, scientists were rocked by several earthquakes felt through the hull of the research vessel Kaimikai O Kanaloa (RV KOK) as they steamed over Loihi. On their first pass over the volcano, they noted that Pele's Vents, an area 980 m below the surface where active hydrothermal venting had been recorded by previous cruises, was no longer there. The area was now the site of a pit crater 260 m in diameter and 300 m deep (named "Pele's Puka"), roughly the same size as similar craters at Kilauea. Water samples recovered from the area near Pele's Puka were 2.5°C warmer than the surrounding water and highly acidic, indicating that they were nearly saturated in carbon dioxide. The water samples were milky brown in color because of suspended fine particles of what is probably volcanic glass. These characteristics, along with other chemical indicators, imply that the samples were taken very close to an underwater volcanic eruption. 7 August. Scientists raised and lowered instruments in the water, mainly looking for anomalies in water temperature and chemistry and also listening for sounds that might indicate an eruption. Except for the area around the peak of Loihi, the sounds and water appeared normal, but toward the S end of the summit region the water was considerably warmer than usual, charged with carbon dioxide, and loaded with suspended particles. This "plume" of warm water was among the most intense ever recorded in the ocean. Sonobuoys, which broadcast sounds back to the ship by radio from underwater microphones, picked up crackling and grinding noises in the summit area, which could have been sounds of an eruption in progress. 8 August. Scientists in the PISCES V manned submersible landed near the highest point of the seamount (PISCES Peak) and worked their way slowly toward the new pit crater through murky waters, with visibility <2 m at times. 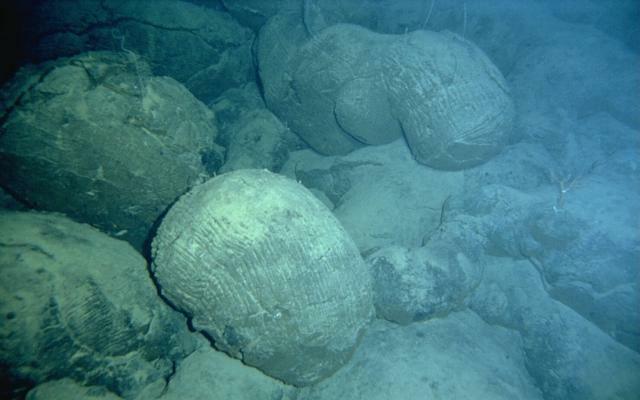 Most of Loihi's surface consisted of large broken boulders and parts of basaltic pillows. Several areas along the 3-km-long route displayed fresh surfaces that may have been uncovered by large landslides or shaking associated with the recent earthquakes. Older surfaces are typically light brown whereas fresh surfaces are nearly black. While traversing the edge of West Pit, a previously existing pit crater on the W side of the summit, several glassy fist-sized rocks were recovered that had been thrown out of the crater together with glassy black sand. Because this deposit was very thin and present only in a few patches, it was thought to be the result of a landslide on the other side of West Pit that threw debris across the crater and onto the opposite rim. A visit to Pele's Pit, the new pit crater detected by shipboard instruments, showed that it was indeed present and that the Pele's Vents area was destroyed by this crater-forming event. The pit was nearly filled with a cloud of murky water. 9 August. Divers on the submersible examined the summit region on 8 August, including the new pit crater. Particle-laden water in the vicinity of the new pit crater was similar to that found at mid-ocean ridge volcanoes in the aftermath of eruptive activity. The dive on 8 August also found the summit-region sediment to consist of white, sand-sized particles of unknown composition and volcanic glass. 10 August. More evidence for extensive disruption on Loihi's summit was observed. Bottom water was apparently very murky, with visibility dropping to <2 m in places. These conditions prohibited extensive exploration of the new terrain, and limited the extent to which hydrothermal fluids or rocks could be sampled. Although there was extensive rubble on the summit, there was no clear evidence for fresh extrusive lava that would have been produced during a summit eruption. This tentative conclusion may be due to the limited visibility and time for exploration of the summit. Information Contacts: Hawaii Center for Volcanology, Department of Geology & Geophysics, University of Hawaii at Manoa, 2525 Correa Road, Honolulu, HI 96822 USA (URL: http://www.soest.hawaii.edu/GG/hcv.html); Hawaiian Volcano Observatory (HVO), U.S. Geological Survey, PO Box 51, Hawaii National Park, HI 96718, USA (URL: http://www.soest.hawaii.edu/hvo/). The onset of an intense earthquake swarm, which began in mid-July, prompted a rapid-response cruise and submersible dives during early August (BGVN 21:07). Scientists from the University of Hawaii once again used the research vessel Ka'imikai O Kanaloa (R/V KOK) and PISCES V manned submersible to carry out two follow-up research cruises over Loihi during 26-28 September and 2-10 October, respectively. The following summarized observations are from reports of the Hawaii Center for Volcanology. Observations on 26-28 September. During 26 September the divers found hydrothermal venting on the bottom of the newly formed Pele's Pit (figure 9). In the summit area N of East Pit, no volcanic activity was observed, but a number of broken-up pillows were discovered. There was no activity at West Pit, however, the divers saw columnar basalt that appeared to be teetering due to collisions from debris slides. Some noise was heard with sonobuoys the next day. In East Pit on 27 September, divers saw a mudslide but no venting. Visibility was poor due to particles coming from Pele's Pit via a channel between the two pits. In Pele's Pit, active venting was observed on the upper W wall below Pele's Lookout. The divers encountered vents early during the dive on 28 September. The dive was aborted after the submersible brushed an unseen wall and damaged a thruster. Figure 9. Sketch map of the Loihi Seamount. View is from the SSE. After Carlowicz (1996); original image by J.R. Smith, Jr., University of Hawaii. Observations on 2-3 October. The dive on 2 October began in the "sand channel" between the pre-existing East Pit and the new Pele's Pit. The bottom of the channel was covered with a thick layer of fine-grained sediments. A miniature temperature recorder (MTR) was deployed, and a maximum vent-fluid temperature of >18°C was measured. At the W end of the vent field at Pele's Pit (1,175-m depth), numerous vents were seen; most were covered with white, streaming mats. This area, dubbed the rubble zone, extended perhaps 50-60 m in diameter, and was marked with several locations of recent slides and a few relatively stable benches. At night a tow-yo survey of nearly 18-km length was run up the W side of the main N-S axis of the seamount. A nephelometer detected a large number of plumes over the N half of the survey concentrated at ~1,350 and 1,050 m depth beside a large summit plume at a depth of ~1,150 m.
Vents were found the next day with a maximum vent-fluid temperature of 77°C, a much higher temperature than any previously measured at Loihi. A hydrocast into Pele's Pit showed that water-temperature anomalies had greatly decreased after the rapid-response cruise in August (a few tenths of a degree vs. three degrees). However, a distinct turbidity maximum remained in the bottom waters. Observations on 4-6 October. A submersible dive up the S rift was conducted to investigate the origin of a hydrothermal plume at 1,350-m depth detected on 2 October. A new hydrothermal vent field was found on the rift axis at 1,325-m depth, and was named "Naha Vents". This extensive vent field contained many fresh fractures, including a fissure (1-3 m wide) that vented large volumes of water. A smaller vent had a measured temperature of 11.2°C. The dive concluded farther up the rift at the site of the previously active Kapo's Vents (1,250-m depth); no hydrothermal activity was observed there. At night a ship-based water sampling program included a ~13 km long SW-NE tow-yo survey across the summit (the tow was run parallel to the predominantly NE current). A hydrothermal plume was first detected 6.5 km downcurrent from the summit. Observations on 5 October showed that the Naha vent field was ~20 x 30 m, and was heavily covered with nontronite deposits and tan bacterial mats. The field contained many small vents, as well as diffuse flows through fractured pillows and large fissures. The highest vent-fluid temperature was 22.7°C. Night water sampling (vertical hydrocast) 1.4 km downcurrent (NE) from the summit revealed six major turbidity maxima at depths of 1,050-1,330 m. The strongest signal, at 1,080 m, was associated with a significant temperature anomaly. This suggested that there might be an undiscovered major source of venting at the summit (all of the vents discovered thus far are below 1,180 m). Water sampling the night of 6 October better located the sources of the large shallow (1,000-1,105 m depth) turbidity and temperature-anomaly maxima observed on 5 October. Hydrocasts and tow-yos across the seamount suggested that a major venting site should be just S of Pele's Pit near the top of the S rift. Observations on 7-10 October. An MTR showed a slow increase in temperature from 48 to 53°C over its deployment during 4-7 October, with some daily variations. The dive on 7 October explored a site covered with nontronite-coated gravels where diffuse venting was observed at a depth of 1,099 m. This field was likely an early stage of the "finger vent"-type hydrothermal fields seen previously on Loihi, and was named "Ula Vents". The dive concluded on the steep W flank of the summit at a site of previously observed intermittent venting (Maximilian Vents) at 1,249-m depth. A night water sampling program ran two perpendicular 5-km-long tow-yo sections near the summit. In the both runs, plume maxima were in the vicinity of Kapo's Vents. A hydrocast at West Pit indicated a substantial particle plume above the pit with no associated temperature anomaly. The 8 October dive began just W of the site of Kapo's Vents, a small field that was active in the late 1980s. As on the section of the S rift already explored, large volumes of clay- to gravel-sized sediments covered much of the area. Pele's hair and flat sheets of glass that formed as walls of large lava bubbles were common. One interesting feature was ~5-cm-diameter holes at several sites in the sand layer that appeared to be locations of recently terminated venting. An area of modest venting through a mound of small nontronite-covered boulders was found at a depth of 1,196 m. A maximum vent-fluid temperature of 17.2°C was measured. At night a S-to-N tow 3 km W of the seamount axis showed that the bulk of the hydrothermal plume above Loihi had shifted from the WSW to the NE over the previous few days. Dive operations the next day focused on completing work at Lohiau Vents. The dive finished at the E end of the vent field and collected rocks bearing several high-temperature sulfide minerals; these suggested that vent-fluid temperatures during the July-August seismic event might have been much higher. The hydrothermal site sampled on 8 October at a depth of 1,196 m on the S rift was confirmed to be a new field. It was named "Pohaku Vents". On 10 October, a repeat of the tow-yo section made on 8 October revealed that the plume had shifted to nearly due N. This shift during only a few days indicated the speed at which the ocean currents carrying the Loihi plumes could change their orientation. During the whole cruise, 71 km of tow-yos were conducted, making Loihi one of the most intensively studied submarine hydrothermal systems. Reference. Carlowicz, M., 1996, Earthquake swarm heats up Loihi: EOS, v. 77, no. 42, p. 405-406. The following report summarizes a series of Loihi updates provided by the Hawaii Center for Volcanology. The largest swarm of earthquakes ever recorded at the Hawaiian volcanoes occurred below Loihi Seamount during July-August 1996. Pele's Pit, a new pit crater, was detected during scientific dives after the seismic events. Pele's Pit formed at the site of Pele's Vents, a preexisting hydrothermal vent field. The events of July-August 1996 are detailed in BGVN 21:07 and 21:09. Report of 1-30 November 1996. Radiometric dating was undertaken using the 210Po-210Pb technique, a process with a 138.4-day half-life, on two fresh lavas collected after the August 1996 seismic event; early results showed that the lavas were of different ages, but both predate the swarm event by 1-10 weeks. A later report of final results indicated that the lavas were erupted in February-March and May-June 1996. A separate set of geochemical analyses were conducted on rocks and sediments from a young breccia deposit on the W flank of Loihi's summit; preliminary geochemical and petrological analysis suggests that magma was stored at a depth of ~10 km before being mixed with a more mafic magma. This mixing of two magmas may have triggered the eruption. Observations of the seamount included a thin coating of hydrothermal sulfides detected at vent site 5 in Pele's Pit and abundant sedimentary deposits of black sand in the summit region and along some sections of Loihi's S rift. The presence of bubble glass fragments indicated that some past eruptions were more violent than previously thought. Formation of ground cracks and fissures on the S rift at 1,300-1,400 m depth occurred at the time of the collapse of the summit pit. The fissures crosscut a previously unknown low-temperature hydrothermal vent field. The lack of temperature anomalies deeper than the new vent field and the small volume of the pit (~0.05-0.15 km3) suggest that the summit collapse was caused by magma intrusion into the upper part of the S rift, but that no eruption ensued. Reports of early-mid and August-October 1997. The seamount was relatively quiet from late 1996 through mid-1997. No new major seismic activity occurred since August 1996. During August and September 1997, manned submersible exploration revealed high-temperature hydrothermal fluids issuing from vents in Pele's Pit and water temperatures up to 200°C. High-temperature hydrothermal mineral deposits similar to those documented on mid-ocean ridge volcanoes were also observed; these did not resemble lower temperature materials previously found at Loihi. Widespread deposits of young-looking volcanic sand were reported on the summit. During the initial deployment of the Hawaii Undersea Geo Observatory (HUGO) in the second week of October, noises that could be interpreted as eruption-related were recorded by a hydrophone. The noises were intense and thunder-like but were not accompanied by elevated seismic activity. Information Contacts: Ken Rubin; Lester Sacks, Khal Spencer, Kevin Johnson, Mike Garcia, Marc Norman, and J.M. Rhodes, Hawaii Center for Volcanology, Department of Geology & Geophysics, University of Hawaii at Manoa, 2525 Correa Road, Honolulu, HI 96822 USA (URL: http://www.soest.hawaii.edu/GG/hcv.html); David Clague, Monterey Bay Aquarium Research Institute, P.O. Box 628, Moss Landing, CA 95039 USA. The Hawaii Undersea Geo-Observatory (HUGO) was visited on 19 January by the Pisces V submersible for the first time since its installation in mid-October 1997 (BGVN 22:09). The observatory, which consists of a hydrophone, and temperature and pressure sensors at a depth of 1.2 km, ceased operating in late October due to electrical problems; it was repaired and immediately began recording. At this time, whale sounds, but no volcanic activity, were heard at the seamount. In early February, HUGO monitors indicated an eruption was underway. Transient acoustic signals with varying frequencies from several hertz to several kilohertz were recorded on the hydrophone. The signals varied in duration from seconds to minutes. A signal consisting of a low frequency "roar" followed by a high frequency "hiss" that lasted for several minutes occurred several times per day. The exact location of the eruption has not been determined; based on signal arrival times at the HUGO instruments and at the ocean surface, the eruption was estimated to be occurring within 2 km of the HUGO array at Loihi. An article by The 1996 Loihi Science Team (1997) discusses mid-1996 observations and includes a contoured bathymetric map of the summit area. Reference. The 1996 Loihi Science Team, 1997, Researchers rapidly respond to submarine activity at Loihi volcano: Hawaii, Eos, Transactions, American Geophysical Union, v. 78, no. 22 (3 June 1997), p. 229. Caplan-Auerbach, J., and Duennebier, F., 2001, Seismic and acoustic signals detected at Loihi seamount by the Hawaii Undersea Geo-Observatory: Geochem. Geophys. Geosyst., 2, paper 2000GC000113, May 25 2001. Information Contacts: Ken Rubin and Mike Garcia, Hawaii Center for Volcanology, Department of Geology & Geophysics, University of Hawaii at Manoa, 2525 Correa Road, Honolulu, HI 96822 USA (URL: http://www.soest.hawaii.edu/GG/hcv.html). On the afternoon of 10 September 2001 an earthquake swarm began at Loihi. The swarm began with a M 5 earthquake and was followed by M 3.5-4.9 earthquakes until the morning of 11 September. This was the most severe swarm at Loihi since July 1996, when the summit collapsed. Two earthquakes that occurred on 13 September may have also been part of the swarm. The two later earthquakes occurred at 0311 and 0839 and had magnitudes of 4.9 and 4.4, respectively. Most of the earthquakes from 10-13 September were ~12 km deep and located slightly S of Loihi's summit. Background. Loihi seamount, the youngest volcano of the Hawaiian chain, lies about 35 km off the SE coast of the island of Hawaii. Loihi (which is the Hawaiian word for "long") has an elongated morphology dominated by two curving rift zones extending north and south of the summit. The summit region contains a caldera about 3 x 4 km wide and is dotted with numerous lava cones, the highest of which is about 975 m below the sea surface. Deep and shallow seismicity indicate a magmatic plumbing system distinct from that of Kilauea volcano. Abundant fresh, sediment-free lavas attest to the youthful age of the volcano. During 1996, a new pit crater was formed at the summit of the volcano and lava flows were erupted. The summit platform includes two well-defined pit craters, sediment-free glassy lava, and low-temperature hydrothermal venting. An arcuate chain of small cones on the W edge of the summit extends N and S of the pit craters and merges into the crests of Loihi's prominent N and S rift zones (Fornari and others, 1988). Continued volcanism is expected to eventually build a new island at Loihi; time estimates for the summit to reach the surface range from roughly 10,000 to 100,000 years. Our previous report (BGVN 26:09) discussed an earthquake swarm in September 2001; this report lists larger earthquakes near Loihi during 1998-2006. In addition, it presents graphics depicting Loihi morphology and makes reference to some recent research there. An M 4.7 earthquake occurred with epicenter 24 km NW of Loihi seamount at a focal depth of 40 km at about 1600 hours on 18 January 2006 (according to the U.S. Geological Survey (USGS) Earthquake Information Center (NEIC)). Such a depth would rule out the signal representing an eruption of the volcano. No damage occurred on land. Head scientist Jim Kauahikaua at the Hawaii Volcano Observatory (HVO) said the earthquake was felt as far as Pepeekeo, 16 km N of Hilo. Table 1 gives a summary of earthquakes of M 4 or greater reported near Loihi since 1998. Table 1. Summary of earthquakes of M 4 or greater reported near Loihi (within a radius of 25 km from the summit) during 1998 to September 2006. Magnitudes: mb = body wave, MD = duration (coda-length) magnitude, ML = local magnitude. Distance is from the center point of Loihi (18.92°N, 155.27°W) to the epicenter. See BGVN 26:09 for additional details about the 11-13 September 2001 events. The events on 7 December 2005 are the three largest from a swarm of ~100 earthquakes. There were no earthquakes larger than M 4 during 1999-2000 or 2002-2004. Courtesy of USGS-NEIC. From mid-July through August 1996, instruments had recorded a swarm of thousands of earthquakes (BGVN 21:07 and 21:09). For this period, 84 earthquakes of M 4 or greater were recorded; the largest event, M 4.9 MD, occurred at 0930 UTC on 28 July (2330 local time on 27 July). Observers in a submersible during a cruise from 6-10 August 1996 determined that the swarm was associated with the collapse of Loihi's summit and an eruption (figure 10 and 11). Figure 10. Bathymetry of Loihi seamount indicating the locations of Pele's Pit (the pit crater formed during the 1996 earthquake swarm) and Pisces Peak. To the N and NE of Pele's Pit are two older pit craters, West Pit and East Pit. Contour interval is 100 m; illumination is from the NE. From Caplan-Auerbach and Duennebier (2001). Figure 11. Three-dimensional bathymetric map of the southernmost two-thirds of the Loihi summit platform. Courtesy of HVO web site. Investigators at the Monterey Bay Aquarium Research Institute (MBARI) have been studying Loihi. When lava comes in contact with seawater, it cools so rapidly that it shatters into glass sand and rubble. When lava enters the sea under confined mixing conditions such as those within a lava tube, rapid expansion of seawater to steam in the tube can produce large basalt glass bubbles that shatter into curved, paper-thin, bubble-wall fragments known as "limu o Pele" (Pele's seaweed, figure 12). Such bubble-wall fragments and thin strands of volcanic glass, known as Pele's hair, have been recovered from Loihi seamount and other deep-sea locations around Hawaii. Layered volcaniclastic deposits up to 11 m thick crop out along faults at the caldera's edge on Loihi's summit. The layers include unconsolidated volcanic gravel, sand, silt, and mud. Fragments in volcaniclastic units include fluidal clasts, limu o Pele, highly vesicular to scoriaceous fragments, and Pele's hair (Clague and others, 2003; Clague and others, 2000). Figure 12. Fragments of limu o Pele (upper photo, largest diameters ~ 0.5 mm) and Pele's hair (lower photo, longest specimen is slightly over 1 cm), formed from lava bubbles during eruption (Clague, Davis, Bischoff, Dixon, and Geyer, 2000). Courtesy of MBARI, 2001. The high sulfur and carbon-dioxide contents of these basaltic glass shards suggest that they were erupted at great depth. These fragments indicate that submarine eruptions can be more violent than previously thought, and can produce features to depths of at least 4 km similar to those observed in shallow-water environments. A December 2000 NOAA Research article (Malahoff, 2000) noted that "Three pit craters occupy the summit of Loihi. The southernmost crater, Pele's Pit, formed during a two-week seismic swarm in 1996 that collapsed the hydrothermally active cone Pele's Vents. The new pit has steep walls with the floor located 200 meters below the rim of the crater. The crater floor and north slope are sites of spectacular and extensive hydrothermal venting with water temperatures ranging from 30°C to nearly 200°C. Diverse microbial mats surround the vents and cover the near vertical slopes of Pele's Pit." New organisms identified at Loihi include the bacteria, L2TR and Idiomarina loihiensis (a halophilic g-Proteobacterium (Donachie and others, 2003) and a shrimp, Opaepele loihi (Williams and Dobbs, 1995). Embodying both the topic of limu o Pele and marine organisms, David Clague and colleagues at MBARI have identified foraminifera that incorporated volcanic bubble walls in their tests (figure 13). These were discussed on the MBARI website. "Benthic foraminifera often glue particles to their tests, perhaps for protection from predators. These particles may be sponge spicules, sand grains, or other detritus, depending on the materials available and the 'specialty' of the foram. In sediment cores from the Gorda Ridge, we found forams that 'specialized' in volcanic glass grains and others that 'specialized' in limu o Pele. They effectively concentrated the glass samples for us!" Figure 13. Benthic foraminifera with agglutinated limu o Pele (foram ~ 2 mm across). Image © MBARI 2003. References. Caplan-Auerbach, J., and Duennebier, F., 2001, Seismicity and velocity structure of Loihi seamount from the 1996 earthquake swarm: Bulletin of the Seismological Society of America, v. 91, no. 2, p. 178-190. Clague, D.A., Baiza, R., Head, J.W., III, and Davis, A.S., 2003, Pyroclastic and hydroclastic deposits on Loihi Seamount, Hawaii, in Explosive Subaqueous Volcanism, White, J.D.L., Smellie, J.L., and Clague, D.A. (eds. ): Geophysical Monograph 140, American Geophysical Union, p. 73-95. Clague, D.A., Davis, A.S., Bischoff, J.L., Dixon, J.E., and Geyer, R., 2000, Lava bubble-wall fragments formed by submarine hydrovolcanic explosions on Lo'ihi Seamount and Kilauea Volcano: Bulletin of Volcanology, v. 61, no. 7. p. 437-449. Davis, A.S., Clague, D.A., Zierenberg, R.A., Wheat, C.G., and Cousens, B.L., 2003, Sulfide formation related to changes in the hydrothermal system on Loihi Seamount, Hawai'i, following the seismic event in 1996: The Canadian Mineralogist, v. 41, p. 457-472. Donachie, S.P., Shaobin, H., Todd, S.G., Malahoff, A., and Alam, M., 2003, Idiomarina loihiensis sp. nov., a halophilic ?-Proteobacterium from the Lo'ihi submarine volcano, Hawai'i: Int J Syst Evol Microbiol, v. 53, p. 1873-1879, DOI 10.1099/ijs.0.02701-0 (International Union of Microbiological Societies). Malahoff, A., 2000, Loihi submarine volcano: a natural extremeophile laboratory: U.S. Dept of Commerce, National Oceanic and Atmospheric Administration, Office of Oceanic and Atmospheric Research (http://www.oar.noaa.gov/spotlite/archive/spot_loihi.html), 12 October 2006. Williams, A.B, and Dobbs, F.C, 1995, A new genus and species of caridean shrimp (Crustacea: Decapoda: Bresiliidae) from hydrothermal vents on Loihi Seamount, Hawaii: Proceedings of the Biological Society of Washington, v. 108, p. 228-237. Information Contacts: Hawaii Center for Volcanology, University of Hawaii at Manoa, Honolulu, HI (URL: http://www/soest.hawaii.edu/GG/HCV/loihi.html); U.S. Geological Survey Earthquake Information Center (NEIC) (URL: https://earthquake.usgs.gov/neis); Scripps Institution of Oceanography, Marine EM Laboratory (URL: http://marineemlab.ucsd.edu); Monterey Bay Aquarium Research Institute (MBARI), 7700 Sandholdt Road, Moss Landing, CA 95039-9664, USA (URL: http://www.mbari.org/); Hawaiian Volcano Observatory (HVO), U.S. Geological Survey, PO Box 51, Hawaii National Park, HI 96718, USA (URL: https://volcanoes.usgs.gov/observatories/hvo/); Alexander Malahoff, Institute of Geological and Nuclear Sciences Ltd. (GNS), Avalon, Lower Hutt, P.O. Box 30 368, New Zealand. The Global Volcanism Program has no synonyms or subfeatures listed for Loihi. Loihi seamount, the youngest volcano of the Hawaiian chain, lies about 35 km off the SE coast of the island of Hawaii. Loihi (which is the Hawaiian word for "long") has an elongated morphology dominated by two curving rift zones extending north and south of the summit. The summit region contains a caldera about 3 x 4 km wide and is dotted with numerous lava cones, the highest of which is about 975 m below the sea surface. The summit platform includes two well-defined pit craters, sediment-free glassy lava, and low-temperature hydrothermal venting. An arcuate chain of small cones on the western edge of the summit extends north and south of the pit craters and merges into the crests prominent rift zones. Deep and shallow seismicity indicate a magmatic plumbing system distinct from that of Kilauea. During 1996 a new pit crater was formed at the summit, and lava flows were erupted. Continued volcanism is expected to eventually build a new island; time estimates for the summit to reach the sea surface range from roughly 10,000 to 100,000 years. Clague D A, Davis A S, Bischoff J L, Dixon J E, Geyer R, 2000. Lava bubble-wall fragments formed by submarine hydrovolcanic explosions on Loi'hi Seamount and Kilauea volcano. Bull Volcanol, 61: 437-449. Fornari D J, Garcia M O, Tyce R C, Gallo D G, 1988. Morphology and structure of Loihi seamount based on SEABEAM sonar mapping. J. Geophys. Res, 93: 15,227-15,238. Garcia M O, Rubin K H, Norman M D, Rhodes J M, Graham D W, Muenow D W, Spencer K, 1998. Petrology and geochronology of basalt breccia from the 1996 earthquake swarm of Loihi seamount, Hawaii: magmatic history of its 1996 eruption. Bull Volcanol, 59: 577-592. Guillou H, Garcia M O, Turpin L, 1997. Unspiked K-Ar dating of young volcanic rocks from Loihi and Pitcairn hot spot seamounts. J. Volcanol. Geotherm. Res., 78: 239-249. Klein F W, 1982. Earthquakes at Loihi submarine volcano and the Hawaiian hot spot. J. Geophys. Res, 87: 7719-7726. Klein F W, Koyanagi R Y, 1979. Seismicity of Kilauea and Loihi volcanoes, Hawaii (abs). Hawaii Symp Intraplate Volc & Submarine Volc, Hilo, Hawaii, Abs, p 124. Malahoff A, 1987. Geology of the summit of Loihi submarine volcano. U S Geol Surv Prof Pap, 1350: 133-144. Moore J G, Clague D A, Normark W R, 1982. Diverse basalt types from Loihi seamount, Hawaii. Geology, 10: 88-92. Moore J G, Normark W R, Lipman P W, 1979. Loihi seamount-a young submarine Hawaiian volcano (abs). Hawaii Symp Intraplate Volc & Submarine Volc, Hilo, Hawaii, Abs, p 127. 7050 BCE ± 7000 years Unknown Confirmed 0 Potassium-Argon East flank? There is no Deformation History data available for Loihi. There is no Emissions History data available for Loihi. Submarine extrusion of magma produces a characteristic "pillow lava" morphology, as seen here on Loihi seamount SE of the island of Hawaii. Thin streams of molten lava are extruded in a form that resembles toothpaste squeezed out of a tube. The outer surface of the molten lava is quickly chilled by the water and solidifies, while the interior remains molten and continues to flow, lengthening the tubes. Lava flows with similar textures on land can be recognized as being uplifted submarine (or sublacustral) lavas. Photo by the Hawaii Undersea Research Laboratory (University of Hawaii). 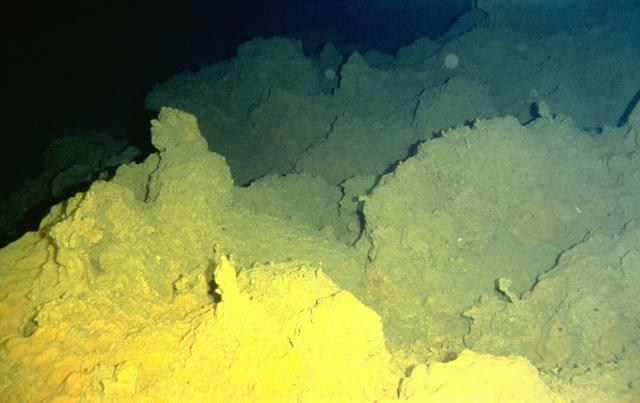 Sulfur deposited from fumarolic vents coats lava flows on Loihi seamount. Loihi, the youngest Hawaiian volcano, rises to within 975 m of the sea surface 35 km off the SE coast of the island of Hawaii. Two rift zones, oriented N-S, give the volcano an elongated form, and prompted its name, which is the Hawaiian word for "long." Fresh, sediment-free lava flows indicate the young age of the submarine volcano, and seismic swarms related to intrusive or eruptive activity have been recorded frequently. IRIS seismic stations/networks Incorporated Research Institutions for Seismology (IRIS) Data Services map showing the location of seismic stations from all available networks (permanent or temporary) within a radius of 0.18° (about 20 km at mid-latitudes) from the given location of Loihi. Users can customize a variety of filters and options in the left panel. Note that if there are no stations are known the map will default to show the entire world with a "No data matched request" error notice. Large Eruptions of Loihi Information about large Quaternary eruptions (VEI >= 4) is cataloged in the Large Magnitude Explosive Volcanic Eruptions (LaMEVE) database of the Volcano Global Risk Identification and Analysis Project (VOGRIPA).